NOMINATED FOR THE 2010 “BEST NOVEL” EDGAR BY MYSTERY WRITERS OF AMERICA. Then it’s all disrupted by the appearance of a nightmare figure from Rose’s past, who threatens everything the three of them have built together. Poke learns that Rose has kept secrets he might not be able to accept. The only hope is for him to discover the whole truth of Rose’s long journey into darkness—the transformation that turned a shy, awkward, village teenager into the “queen” of Asia’s most lurid red-light district, Patpong Road. Riveting, genuinely moving, and entirely plausible. Miaow’s entry into a stormy adolescence and her parents’ efforts to deal with it are knowingly written. Even Bangkok seems more richly detailed than in past adventures . . . 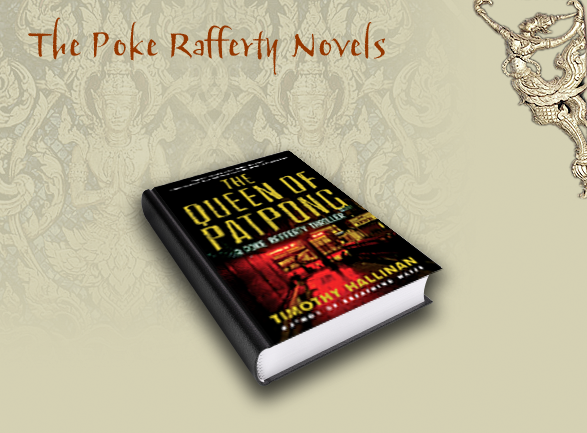 The Queen of Patpong is a terrific page-turner, and the surprising denouement will thrill readers who want the good guys—or girls—to win in the end. Hallinan takes his Poke Rafferty series to the next level with this taut, offbeat and fast-moving thriller....Sometimes funny, always engrossing, and undeniably authentic. You won't read a better thriller this year!